The Evia Pavilion creates a wonderful entertaining space positioned in your garden. By adding a garden room to your home, you can create a truly unique entertaining space for your friends and family. 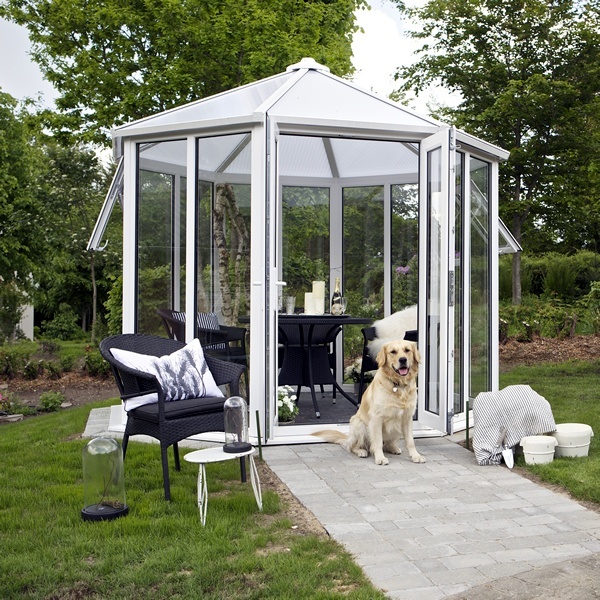 The insulated and double glazed garden room incorporates your new room into the beautiful surrounds of your garden. Embrace the Scandinavian feeling of Hygge with friends, a winter’s night, a delicious dinner, fine wine, candles flickering in a warm cosy garden room. Combining modern materials, expert manufacturing and creative flair, Nordic Garden Buildings have developed a range of visually stunning garden Pavilions that compliment any style of Home and Garden. By adding a light, bright, insulated garden Pavilion to your home, you will discover a new way to relax and embrace the beauty of the four seasons. Please note: all sizes shown are internal measurements. For external sizes and base size requirements, please contact us. Robust, strong and built to last. 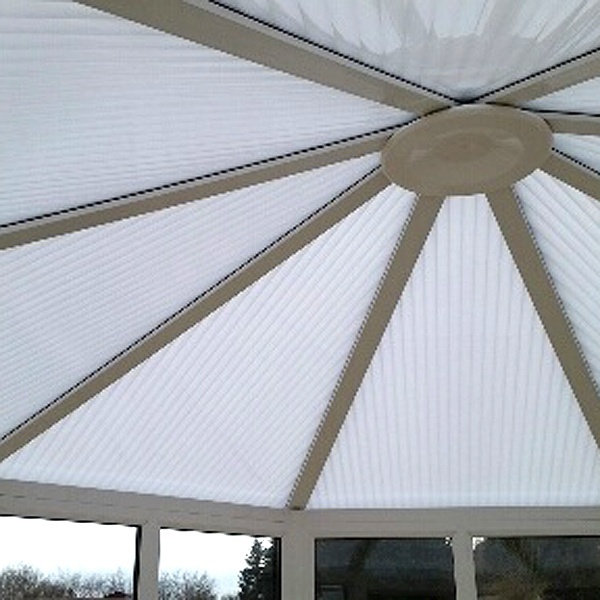 Our garden room's are made from PVC-u, which makes the product virtually maintenance-free. Maintenance-free and thermally efficient. Nordic Pavilions will not rot or require painting and shrink or expand like wood. Insulated and quiet, heat retention in winter is increased. Multi-wall polycarbonate available in a choice of colours. Multi-point locking ensures your contents are safe and secure. Delivery and installation by skilled fitters onto a suitably prepared base (not included). The ECO base is pre-cut specifically to the Nordic Garden Building of your choice. Whether you want a white or a more traditional wood grain finish you have a choice of 6 colours. All colours include a white interior. Interior colour upgrade available on Golden Oak or Rosewood buildings. For that truly spectacular finish, add an attractive finial. Add vinyl flooring to your building - available in five distinctive styles! This is the smaller of the Evia Pavilions with 64 sq ft. of living space provided. 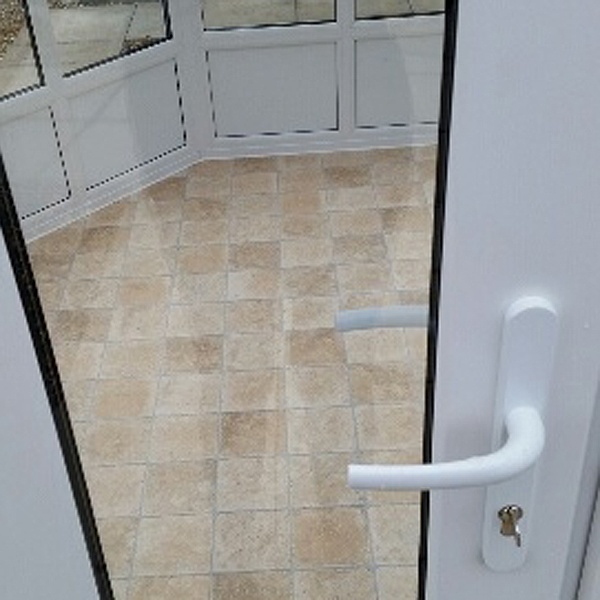 White external and internal PVCu framework with full length toughened safety glass as pictured is the standard format. The building includes double doors with multi point locking, 2 lockable windows, adjustable door hinges, and low aluminium threshold. These buildings are robust, built to last, and virtually maintenance free. All of our Nordic summerhouses include the Nordic ECO Base and installation using the manufacturer's own experts to ensure that the job is done to their exacting standards. 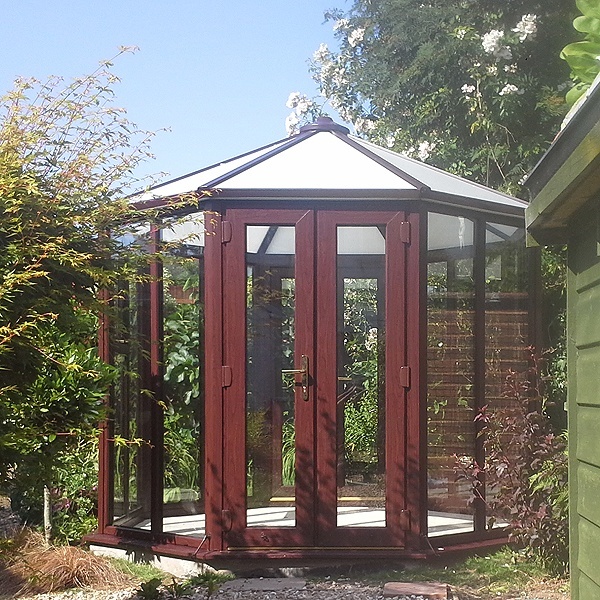 This is a great example of the Rosewood finish available on the Nordic range of summerhouses. The attention to detail is obvious even at a distance ! The Evia, Sylt, and Gozo models each have a set of double doors as standard with white door handles and secure multi point locking. The polycarbonate comes either clear as pictured, or opal, bronze or 'external bronze and internal opal'. Pictured here are the optional rear panels available for all Nordic buildings. On the left side you will see the T&G effect panels on a ‘Grey’ coloured Melbourne pavilion, with the internal view below it. On the right side the flat panels are shown on a ‘Golden Oak’ coloured Sylt pavilion, with the internal view below it. You'll see from the rear views that the panels are colour matched to the rest of the frame. Internally the panels are white to match the internal frame. You cannot have ‘flat on the inside and T&G on the outside’ (or vice versa). They are either flat or T&G. These styles of panels are available throughout the Nordic Range. They are a great option to hide hedges and fences where a building fits in the corner of the garden or simply to provide privacy. 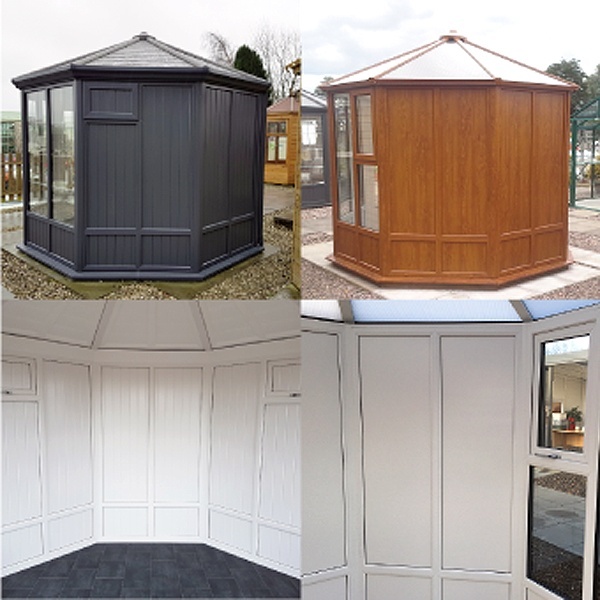 All Nordic garden buildings are delivered directly to your door from the manufacturer's factory in Wales and installed by Nordic's professional installation team - who are experts in fabrication and construction of PVCu buildings (we do not use contractors). We require easy access to your garden and you should notify us of any obstructions or narrow passages when you place order. As with of all garden buildings, you will need to ensure our installation team have a flat and level base to work from. Supplied as standard with your building is the Nordic ECO base, all we require is a flat (spirit level flat) and compact ground to install on. Our delivery times can vary from season to season, but typically you should expect to receive your building around 3-4 weeks from when you place your order. All of our buildings are made to order, so during the busy spring to summer seasons this may increase to 6-10 weeks dependent on the building that you have purchased. Please feel free to contact us on 0800 999 0123 to check our current delivery times. Where Can I See Nordic Garden Buildings Summerhouses?